Over the past few months, we’ve collected some gems on our blog. Algeria and oil: Are EU gas supplies more important than human rights? Austerity: Austerity hypocrisy: military spending is spared the chop // Who pays for high military spending? // Welfare or arms fair: what would you choose? 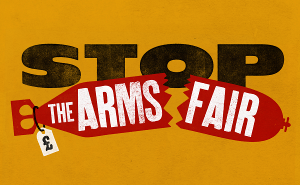 Protesting your a local arms company: Wherever they seek to do business, we aim to stop them. Write to your local newspaper about DSEI: The pen is mightier than the tank? // DSEI tries to stay secret. Help us spread the word! Noise-making outside EDO factory: USA and France still want to attack Syria: resist! Don’t forget to check through our full events list too!